Let’s approach this from a different angle shall we because the normal questions and answers have clearly not cleared this up so far. This is an intellectual and logical approach and I hope those of us that are can appreciate the simplicity of this question and those that are not, well then you know why. Starting off with a simple example to get you introduced to this angle, I’m sure you’re familiar with the Batman. Anyways the point is that nor Batman or Joker makes little kids into monsters or Heros. Religion is a choice – it is a fact of Christianity and Islam. People have started wars and hurt people in the name of religion – look at the past and history. If you can even find one person on this earth that has not intentionally harmed another and is a Muslim then if you understand the question – its already answered. do you find peace in reading your favorite book/your favorite thing to do? do you find peace chilling with your kids/someone you love? do you find piece/feel at peace in a church, mosque, library etc? well if any of these relate to you then remember we are not the same so respect that others may even find peace in prison let alone practicing their faith in peace. by now those that are even moderately intelligent and educated would understand what I’m getting at. people still seem to bring up other people, that they say this and they do that, they even bring up books can you imagine, books, words on a page and blame it for crazy acts of atrocities others have made forgetting the simple fact that those are just excuses. understanding or practicing your belief does not make you anything what so ever, however you do the crime, you do the time. it does not matter if you got the idea from a book or tv or a game. you don’t see millions of suicide bombers simultaneously exploding or we wouldn’t be writing nor reading anything anymore, and sorry if you do so millions of suicide bombers walking around or exploding then you’d better find a shink fast. is Christianity peaceful to a Christian? yes to him/her it is. is Buddhism peacefull to a Buddhist? yes, it is. is being a vegan being or feeling peacefull to a vegetarian? yes, it might be. point is folks its actually not for me or you to judge unless you are voted as a judge and you have heard the supposed criminal out. 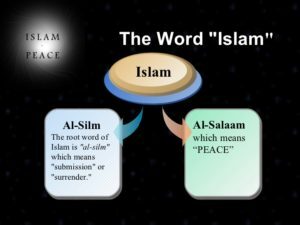 Is Islam a Religion of peace? Yes, it is because the Muslims find it peaceful because the Muslims find peace in it because it is interpreted in a peaceful way by them for them. I think I’ve pretty much covered it. I think as far as countries go, they all have laws, you should get to know them if you’re going there because in some countries you can shoot a bird with your slingshot and in others, you get to stand in front of a judge if you do. in some countries, you can sleep with another man’s wife and vice versa and in others you cant, simple that’s just law it’s up to the majority of that country to make and do with it whatever they will. point is, people that hurt others are not well and they are definitely not in control of themselves, most likely they need medical help because if they were ok and hurting others then you or yours would be too. assuming your one of the OK ones. think logically about what and how your actions may affect someone negatively. it takes just one person to hear or see you do something negative to go spread it around and think of all those people that are not so bright, they will hurt others with your words and views. I will clear this up another time, goodnight.